For years we’ve received occasional reports on the status of the insane Devel Sixteen hypercar. Production has yet to commence. One of the reasons why is that Devel’s development and engineering partner, Manifattura Automobili Torino (MAT) is no longer involved in the project. According to Cool Hunting, however, the Dubai-based company apparently has plenty of customers lined up as the wait list is now two years long. "We’re selective about the buyers. The buyers don’t pick the car. The car picks the buyers,” says Mohammed Al Attar, who founded the company with his two brothers back in 2006. He also confirmed the waiting time to Cool Hunting at the Canadian International Auto Show. Apparently, some progress is happening because Al Attar also said the street-legal version will carry a base price of $1.6 million. "The people that buy these cars are confident and celebrating their success,” he added. Powered by a 12.3-liter V16 engine with a reported 5,007 hp, someone with vast engineering experience to help tame all of that output is necessary. 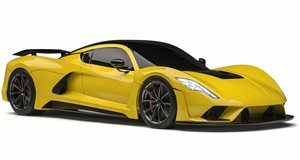 Once MAT departed, sources claimed vehicle prototypes were "still acting pretty much like a giant wing.” Top speed is said to be in the neighborhood of 310 mph, a very similar figure to the also upcoming Hennessey Venom F5 and its 311 mph goal. The hypercar’s design was fighter jet influenced, and even features two F-15 jet-style exhaust ports. There are reportedly V8-powered versions of the Devel Sixteen in development as well with anywhere from 2,000 to 3,000 hp, but no evidence for either exists yet. We’ve also reached out to Devel asking for any further updates so check this space. But even if production were to starts soon, the chances of actually seeing a Devel Sixteen in the flesh are slim. Even with a two-year wait list, we still don’t know how long it takes to build each car and what facilities Devel has at its disposal. Point being, annual production output could be limited to a very small number. We’ll just have to wait and see.